The Annieglass Square Matza Plate is part of the Judaica Collection, a handmade glass collection of serving pieces designed in celebration of Jewish holidays and traditions. Matza is an unleavened bread traditionally eaten during the Jewish festival of Passover. 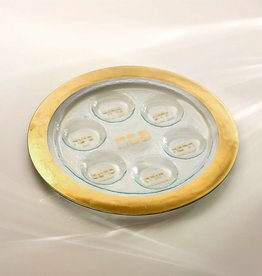 Available in 24k gold or genuine platinum with Hebrew inscription, the handmade glass Matza Plate completes a beautifully set Passover Seder table and pairs perfectly with the Annieglass Seder Plate from the Judaica Collection, along with contemporary dinnerware and serving pieces from the Annieglass Roman Antique Collection. 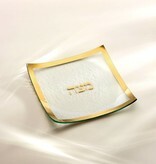 The Annieglass Square Matza Plate makes for a remarkable Jewish wedding gift or Passover gift.